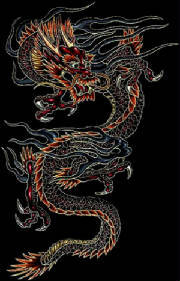 Dragon signifies auspicious, prosperity and wealth for the Chinese. It is also believed that it will also ward off evil spirits and thereby protecting both the owner and his home. Having large armour like scales and distinct barbels resemble that of the Dragon, hence giving it a common name DRAGON FISH. With its bold expression, noble air and elegant movement makes it a hot favourite among hobbyists and aquarists worldwide especially Chinese Bussinessman, often consider it a 'status symbol'. Asian Arowana being one of the most expensive and most sought after fish in the aquatic world are namely - its evolutionary past and the CITES Convention held in 1980. Studies have shown that, the Arowana as a whole, is a primitive fish from the Jurassic era. Fossils of the fish have indicated this fact. Having evolved through tens of millions of years means that it is indeed a very hardy fish. Due to the high demand in the market and low supply from river sources, the Asian Arowana was once closed to extinction, in 1980. Luckly the Convention on International Trade in Endangered Species of Wild Fauna and Flora (CITES) was signed by 72 countries, listing only the 'Asian Arowana' in the first appendix as a highest class protected fish. Microchip tracking technology, is not new and have been around the industry for years now. The main technology is known as Radio Frequency Identification Devices (RFID). 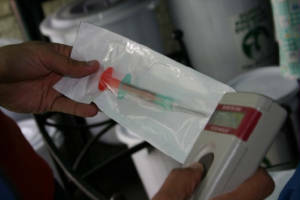 It was initially used for tagging horses and other high-value livestock such as cows. 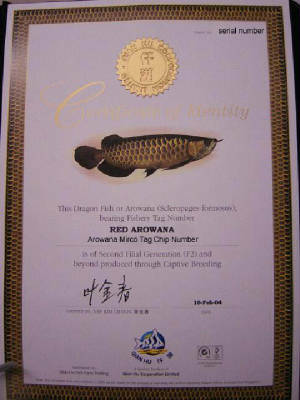 The technology has been so successful that now the mircochips can be used for identifying pedigee or precious pets (such as Siamese cats, pendigree dogs like Labradors and even Arowana). Its important lies in its ability to trace or track the animal or pet in question. Breeders also use this method for the detection of congenital defects in a pedigree and to practice responsible breeding. The microchip is about the size of a grain of rice and it is a simple electronic transponder. The vet will first anaesthetize the pet. 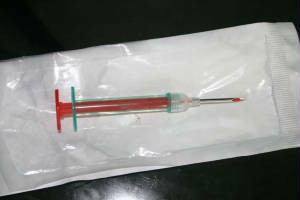 Then a hypodermic needle is used to inject the tiny computer chip containing a unique identification number just under the fish skin. It is usually on the dorsal muscular tissue of the fish. The number on the computer chip is then entered into a privately owned national database. The microchip remains inactive until a scanner is placed near the position of the chip. It then sends out a low radio frequency signal to the chip, providing electrical energy needed to send its unique barcode back to the scanner. That is, the animal's ID number. 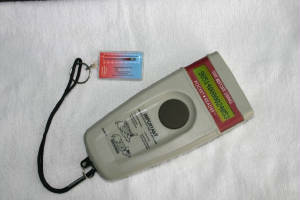 Scanners generate a magnetic field that is intercepted by the microchip. The microchip uses the energy from this field to power itself up. It then transmits a return signal to the scanner that converts it into the microchip's identification code. The resulting alphanumeric identification code is displayed. The microchip will remain with the animal for the rest of its life unless a veterinarian surgically removes the chip. 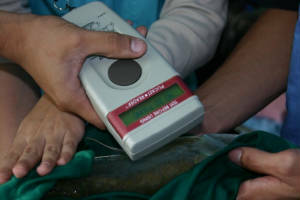 The microchip is extremely useful as it allows the identity of the fish to be stored permanently inside where it cannot be lost or altered or become worn out. The microchip also has an antenna and a capacitor encased in a tiny glass tubemade of soda lime glass, known to compatible with living tissue. It does not incur an immune reaction from the fish. The glass is hermetically sealed to keep any form of moisture out.